With Christmas right around the corner, it is time for me to start making my specialty booze. I normally make Apple Pie, Amaretto, and Kahlua. This last weekend was my Apple Pie run. Mix the apple juice cans, about a quart of the apple cider (if using 180+ proof grain alcohol), and the brown sugar in a large pot and bring it to the spot where it is almost, but not quite boiling. Remove the pot from heat and move it to a place AWAY from flame or hot burner. Add your grain alcohol. If you are using single run moonshine, you might want to cut down on the apple cider at first. Try to eyeball a mixture that will give you about 45% – 50% alcohol by volume. If you are running 180-190 proof booze, you need to just do about a 50/50 mix. If you are using 120 proof stuff you might want to sub out some the cider for an additional concentrated juice can to do a more 2/3 booze to 1/3 boiled stuff mix. When you get it all added and mixed, move the pot back to the heat. Heat it up again to the point where you are starting to get some decent steam, but NOT boiling. Take off the heat and put in Mason jars with a cinnamon stick or two. I use 1 stick per pint of Apple Pie. This seems to give the best flavor in my opinion. (Optional) You can add a vanilla bean or two to each jar if you wish. This gives is a nice, smooth finish. When I use vanilla beans, I go big and put in several. I figure the cinnamon and vanilla can just fight it out to see what flavor rules. Once in a jar, make sure you let it sit for a few days at least. The longer that it sits, the more mellow and smooth the drink is. 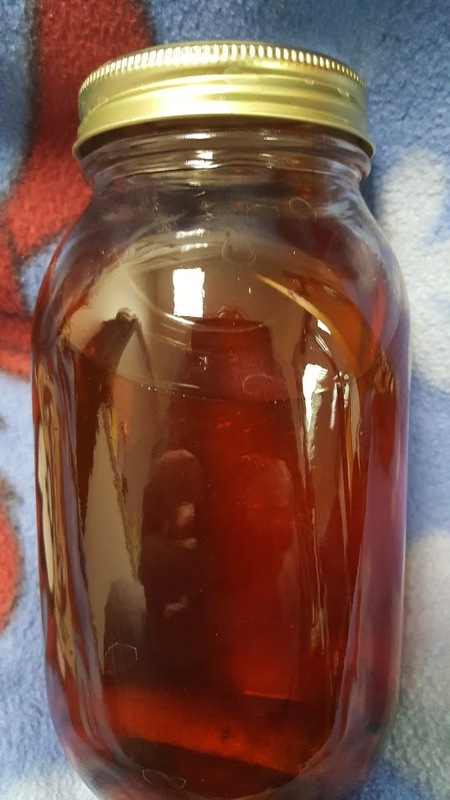 Some stuff I have had that was sitting for almost a year was so smooth that you couldn’t taste the alcohol, but was still sitting at over 100 proof. When I start on my other boozes, I will add those recipes as well. My Kahlua is really incredible. This entry was posted in DIY Projects, Miscellaneous and tagged alcoholic drinks, apple pie, booze, making drinks on December 13, 2016 by Woodsbum. Long story short………. I have been sick as a dog, again. The last time I was seen, I was given an antibiotic via injection. Well, come to find out, the clinic also slipped in tetanus and flu vaccine into the same syringe even though I declined them. Yes, you heard that right. They slipped in the vaccines into the same syringe that held the antibiotic. I wasn’t told about it until after I saw the paperwork and questioned them. They literally SHRUGGED when I reminded them that I had declined the flu and tetanus shots. Flu shots ALWAYS make me very susceptible to each and every bug that passes my way. It has always been that way for me and I suspect that it always will. Suffice it to say that I have been stuck with yet another bout of the “crud”. I am sorry for the sporadic posts, but when I feel like a bucket of smashed assholes the last thing that I want to do is start typing for my own pleasure. Some good news, however. I ripped the engine to my old Dodge apart and found out why it was not working. My cylinder heads had to be rebuilt, will be replacing a few pistons and swapping out all the piston rings in the next week or two. Once that is done, my truck should then run. In hindsight I really should have just ripped the truck apart and rebuilt it myself. It would have saved me a few thousand dollars and I would have had it back on the road already. There will be a post in the next couple days about what I found on my engine, the great work that Tom’s Performance did on the heads, and rest of the work I am doing to fix the damage of the long block I got from S&J. This entry was posted in Miscellaneous and tagged update on December 1, 2016 by Woodsbum.